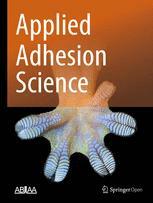 Applied Adhesion Science focuses on the practical applications of adhesives, with special emphasis in fields such as oil, aerospace and biomedical (Dentistry). Topics on the problems related to the phenomena of adhesion and the application of adhesive materials are welcome, especially in biomedical areas such as dentistry adhesives. Both theoretical and experimental works are considered for publication.